"RED SHIRT'S" OPINION OF THE QUEEN. 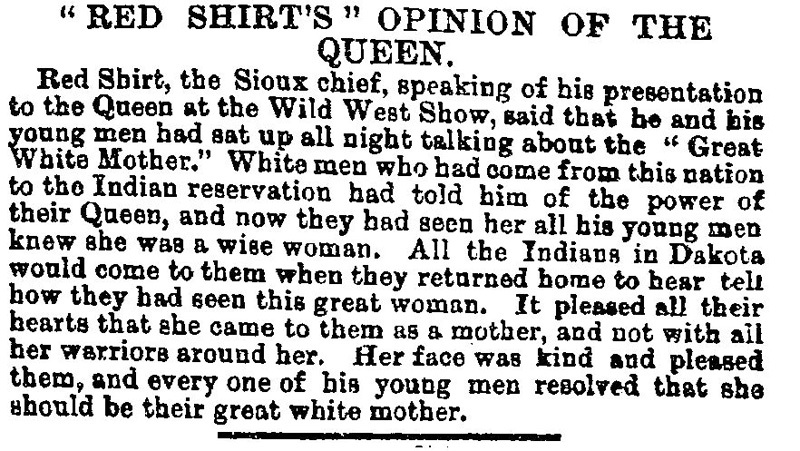 Red Shirt, the Sioux chief, speaking of his presentation to the Queen at the Wild West Show, said that he and his young men had sat up all night talking about the "Great White Mother." White men who had come from this nation to the Indian reservation had told him of the power of their Queen, and now they had seen her all his young men knew she was a wise woman. All the Indians in Dakota would come to them when they returned home to hear tell how they had seen this great woman. It pleased all their hearts that she came to them as a mother, and now with all her warriors around her. Her face was kind and pleased them, and every one of his young men resolved that she should be their great white mother.